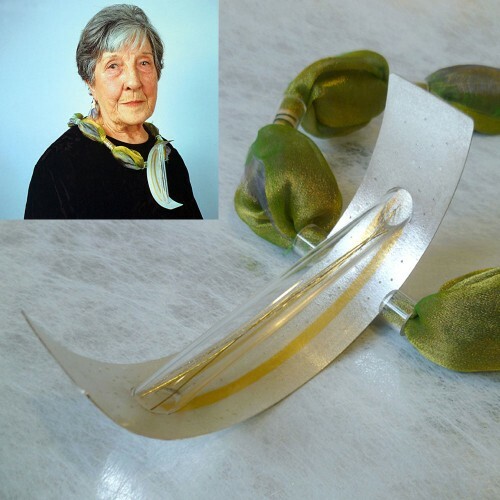 The necklace I designed and made for my Aunt Harriet, for ACJ ‘Commission Me’ exhibition Urbis, Manchester shown at ‘Eye of the Beholder Conference’ ACJ conference 2003. Aunty Harriet’s necklace. The brief was to make a commission for ‘a friend or foe, living or dead’. I chose my aunt, consulting with her, the design evolved from her powerful voice, which she had used to protect those around her, she was a formidably strong woman. I based the main shape on the structure of a voice box showing her voice, as a visible thing- threads passing through the Perspex tube. I chose materials to compliment and reflect her hair and eye colour, using silver, 23ct gold inlay, and organza, linked to her passion for sewing, and lavish but tasteful evening wear.